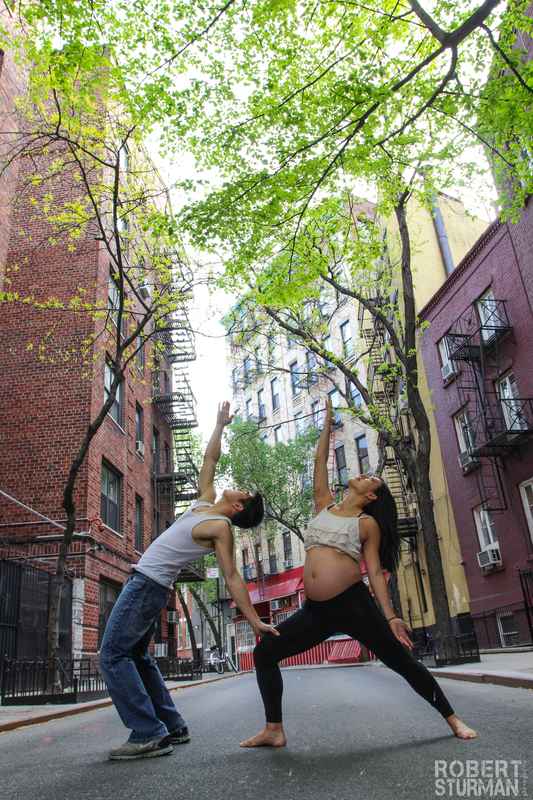 Pregnancy yoga photo shoot with Robert Sturman! 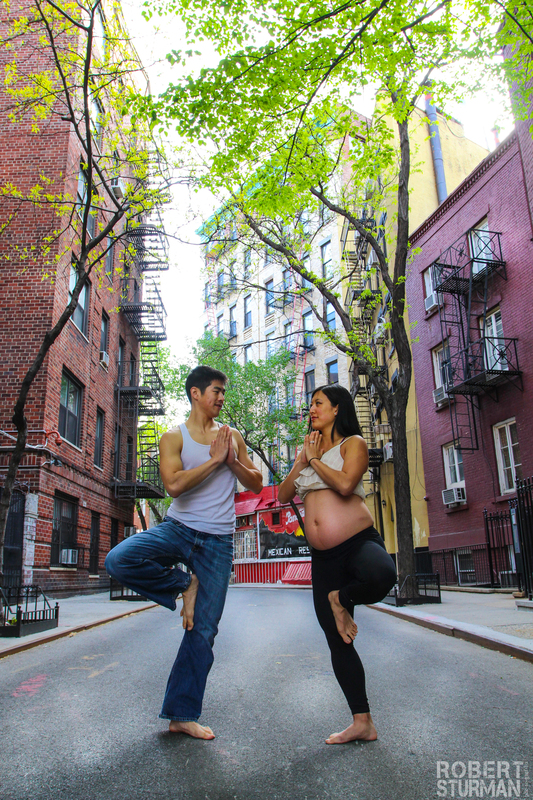 Two and a half weeks ago, my husband and I had the pleasure of meeting with Califorinia-based Robert Sturman for a pregnancy yoga photo shoot in the Greenwich Village while Robert was in town for a few weeks! I have been a huge fan of Robert’s work since I discovered it in the New York Times two years ago, and have been stalking his Facebook page ever since. Since then, he’s captured mesmerizing photos of the Africa Yoga Project, Prison Yoga Project, and yogis worldwide. When he inquired about offering a yoga photography workshop at a studio in New York City on his Facebook page last June, I immediately responded! I was happy to learn how humble and compassionate he is during our initial phone conversation, and was thrilled when he decided to offer his special workshop at my studio! It was a true honor to see him again, and have him document my pregnancy at our recent shoot. I will now forever and always look be able to look at these photos, and recall this special time in my husband and my lives. 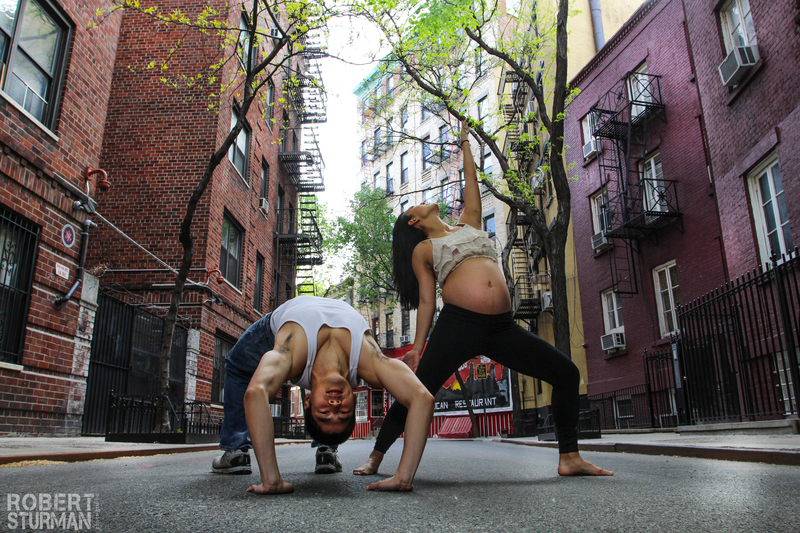 All photos below were taken by Robert Sturman on May 6, 2014 at 28 weeks pregnant. Some of his photos from his recent trip are currently featured in MindBodyGreen’s “Yoga In The Heart of New York City,” including one he took of me. 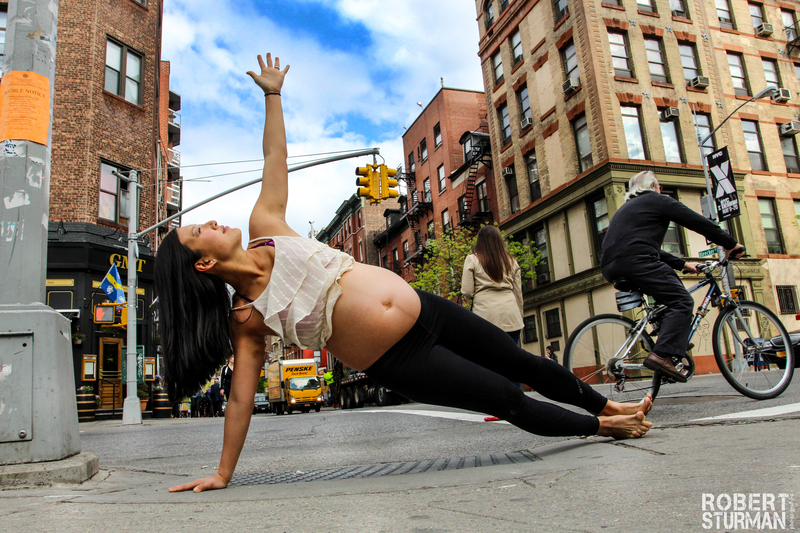 Categories: Pregnancy | Tags: Greenwich Village, New York City, Photo Shoot, Pregnancy, Robert Sturman, Third Trimester, Yoga | Permalink. 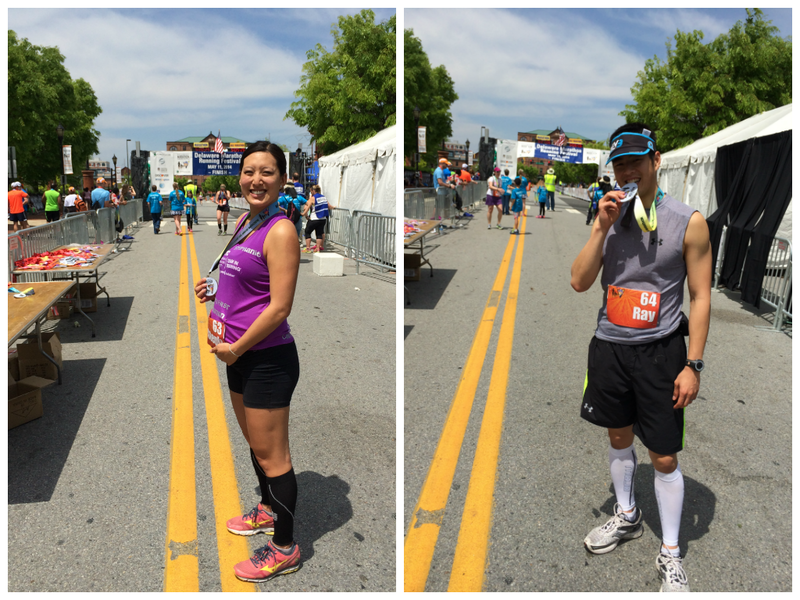 Baby’s first marathon: A race recap of the Delaware Marathon at 29 weeks pregnant! This past Sunday, I finally completed the 2014 Delaware Marathon in 4:54:14, my 16th marathon-plus! Although the marathon was my second slowest ever, it was by far the most special, as it was my husband’s first, and my first for two at 29 weeks pregnant! Additionally, I ran to benefit The Leukemia & Lymphoma Society’s Team In Training, for whom I’ve now raised $12,300 over three seasons. I am sincerely grateful to everyone that donated in loving memory of my grandmother Susie Ying, and to our supportive coaches. Finished the 2014 Delaware Marathon, 5/11/14! The days leading up to the race. My husband and I drove down to northern Virginia the Friday before the race to celebrate Mother’s Day that evening with my mom and three of my sisters, who either currently attend the University of Virginia or reside there, and then my niece’s third birthday on Saturday. I was immediately concerned about how much warmer it was there, with temperatures reaching the 80s, as compared to NYC, which was at least ten degrees cooler. My doula often reminds me, “don’t cook the baby,” as the pregnant body is ten degrees warmer than a non-pregnant one, and, being someone that usually feels warmer than everyone else, I wondered how would handle the heat. I became even more nervous when I literally huffed and puffed through my husband and my 2-mile shakeout run on Saturday morning–not only was I sluggish and slower than usual, but I could feel the weight of the humidity suffocate me like a blanket. I promised myself during the run that I would hydrate at every aid station during the race, approximately every mile or mile and half, whereas I normally do so every 20 minutes. Thankfully, I spent the rest of the morning and afternoon indoors at my niece’s birthday party with my compression socks on and my legs propped up on the couch. Party guests’ questions about the socks and then reaction to why I was wearing made me laugh! My husband and I made the 2.5 hour drive to Wilmington, DE just in time for the end of the designated bib pick up time. Although I normally put a lot of thought into researching restaurants for my marathons, my meals choices generally being almost as important as the race itself, it had slipped my mind for this race’s pre-race meal! I found a local Italian restaurant with positive reviews, Ristorante Attilio, and we headed over without a reservation. After suffering from food poisoning the night before two marathons in the past, the 2011 Paris and 2013 Big Sur, I now always make sure to eat fully cooked, hot foods for two straight days before marathons, and kept it especially “vanilla” that evening being pregnant–my husband and I both had pasta, cheese, tomato sauce and some cooked protein. 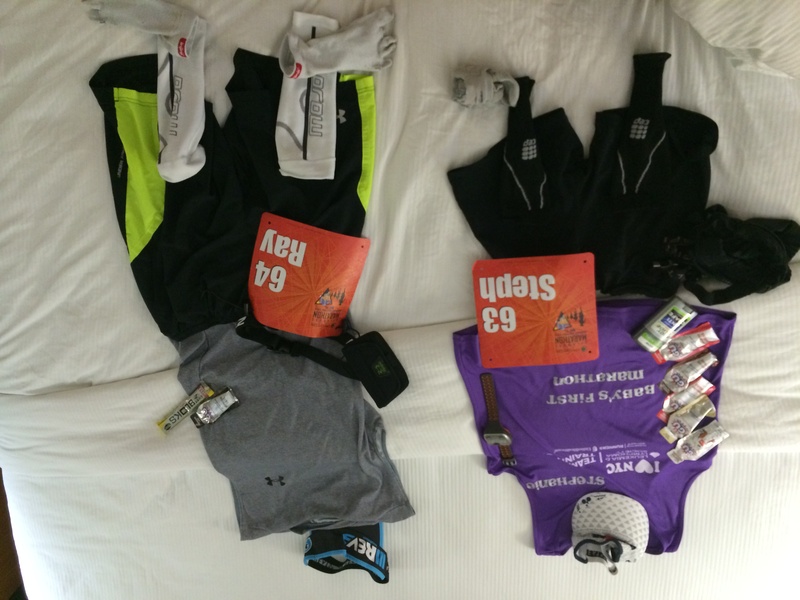 We were pleasantly surprised with a freshly baked chocolate chip cookie for each of us when we checked into our hotel, and laid out all our race gear before sleeping early! The morning of the race. My husband and I awoke at 5:30am, an hour before we had to head out the door. I ate a breakfast consisting of half a whole wheat bagel with peanut butter, half a banana and a quarter cup of coffee with milk, got dressed and prepped for the race, including rolling loads of Body Glide all over, slathering myself with sunblock and securing five GUs to my SPIbelt, and made sure to empty my bowels. I’ve read constipation is a common issue with most pregnant women, but the pregnancy has had the opposite effect on me, as I now go number two up to four times a day, and always expect to at least once during a long run! My husband and I took the ten-minute walk over to the race start, and immediately lined up on the Port-A-Potty line again, knowing that I’d also have to take a number of pee breaks during the race. At 6:55am, when we still had a handful of people in front of us on the line, I gave up on the idea of peeing beforehand, and we rushed over to the starting line just in the nick of time! Miles 1 – 6 (9:40, 9:37, 9:44, 9:36, 9:50, 9:59). My husband and I gave each other a kiss, and wished each other good luck just before we crossed the starting line and parted ways. I typically don’t feel great during the first few miles of a marathon, as it takes at least six miles before I start to find my rhythm, and I was even more uncomfortable during the start of this one! Our baby is now the size of a butternut squash, according to BabyCenter–is my belly too big to handle all this running at this point? Is it going to be too hot today? I’m starting too fast–will I be okay? Questions and concerns loomed over my head, especially as the first few miles were completely unshaded, and two women complained loudly about the heat at Mile 3, one of whom mentioned a female runner from her hometown in Maryland that died the week prior during a half marathon. I started to feel better after Mile 6 when we encountered our first major, one-mile incline, as I love hills, and this one was entirely shaded by lush, full trees. Miles 7 – 12 (12:03 with Potty Break #1, 9:57, 9:50, 10:05, 10:00, 10:00). As I had promised to myself, I grabbed water at every aid station, and was confident that I was drinking enough fluids to compensate for the sweat loss when I had to stop for a potty break at the start of Mile 7. I continued the rhythmic running and breathing that I had started just before the break, my “moving meditation,” as I often call this feeling. Mile 13 – 18 (11:20 with Potty Break #2, 10:00, 10:37, 11:06, 12:28 with Potty Break #3, 11:25). The Delaware Marathon is a double loop, with the half marathoners finishing their respective race at our halfway point, so I could hear the crowds roar as I approached Mile 13. Seeing and hearing the excitement of the crowds, some of whom responded with “Happy Mother’s Day!” as they saw and pointed at my shirt, as well as knowing that half the marathon was literally behind me made me even more excited about the race!! I smiled widely at the spectators, a Cool-Aid grin that was etched across my face until I crossed the finish line, and recalled why I loved about running marathons so much! I also thanked all the volunteers that I passed, especially the police officers that had to direct traffic and deal with a number of really angry drivers–apparently, the town is not the most marathon-friendly. 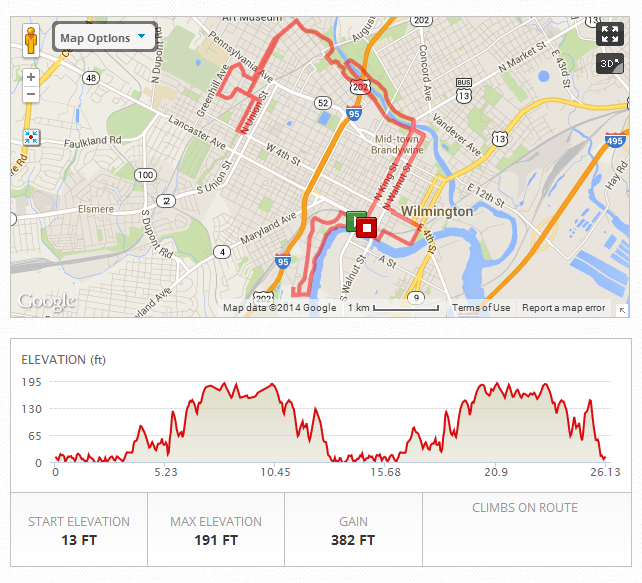 Miles 19 – 26.2 (11:45, 13:16, 13:07, 13:03, 14:41 with Potty Break #4, 13:02, 13:19, 14:14). The rising temperatures, which reached 79 degrees by the finish, and the start of more hills took a toll on me, and my pace started to decline at Mile 17. I started dumping a cup of water on my head at each aid station to cool off. By Mile 20, my pace was slower than it had been for even the JFK 50 Mile Ultramarathon when I had ran it in 2012! At Mile 22, I remembered one of the things I struggle with the most during the last 10K of a marathon, the one constant–nausea. I realized I had only been ingesting water and GU so far, and started loading up on Gatorade at aid stations in hopes that the extra calories and electrolytes would help–my body normally doesn’t respond well to Gatorade, but it hopefully would this time. My hopes became a reality, and I was excited that I only had 4 miles left at that point until the finish, only less than a lower loop of Central Park left, as I like to think of it! A piece of advice: Always count the miles that remain at the end of a marathon, but not at the start. The end of the race. My smile widened, and tears of joy welled up in my eyes as I neared the 26-mile mark! I picked up my pace as I saw the finish line in my sight. The best part was still waiting for me–my husband was standing just beyond the finish line with my medal in his hands. I lept across the finish, and right into him. Our first family marathon was finally finished!! 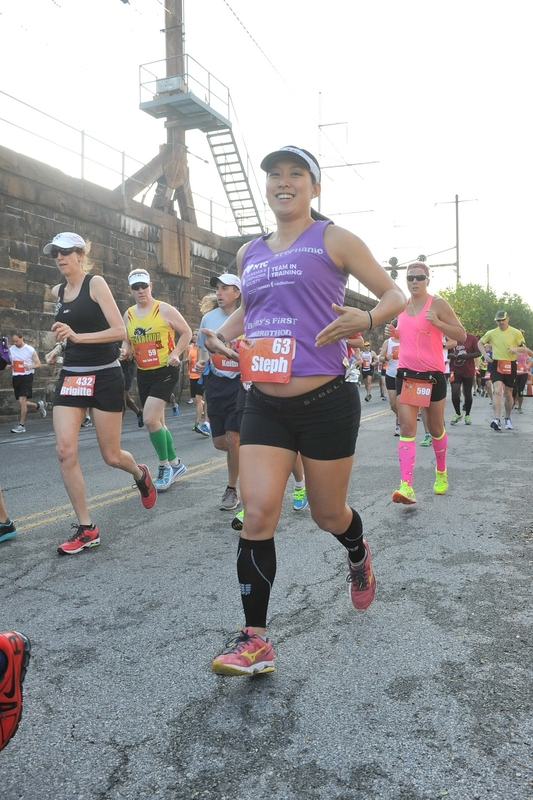 Categories: Athlete, Pregnancy | Tags: Delaware, Family, First Family Marathon, Marathons, Mother's Day, Pregnancy, Running, Team In Training, Third Trimester, Virginia, Week 29 | Permalink. 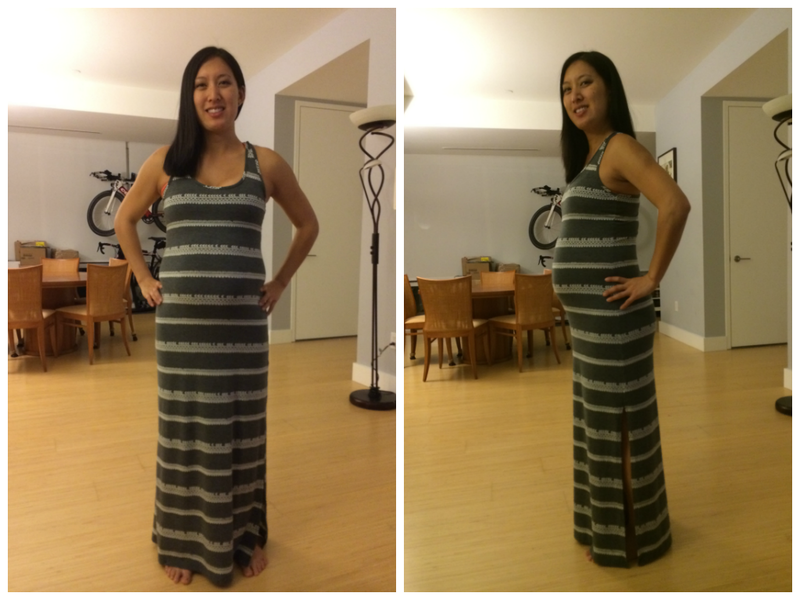 The third trimester is finally here! Swollen feet and legs. With the first day of the third trimester this past Sunday came swelling more severe than I’d ever experienced before in my life! I attributed it, in part, to the fact that I spent a lot of time out with friends this past weekend, and didn’t drink enough water or eat as well as I usually do. I spent the last few days making sure to drink more water as well as my daily green juices, and eat nutrient-dense salads for lunch and well-balanced meals in the evenings, which has seemed to help. More punches and kicks as well rolls too! 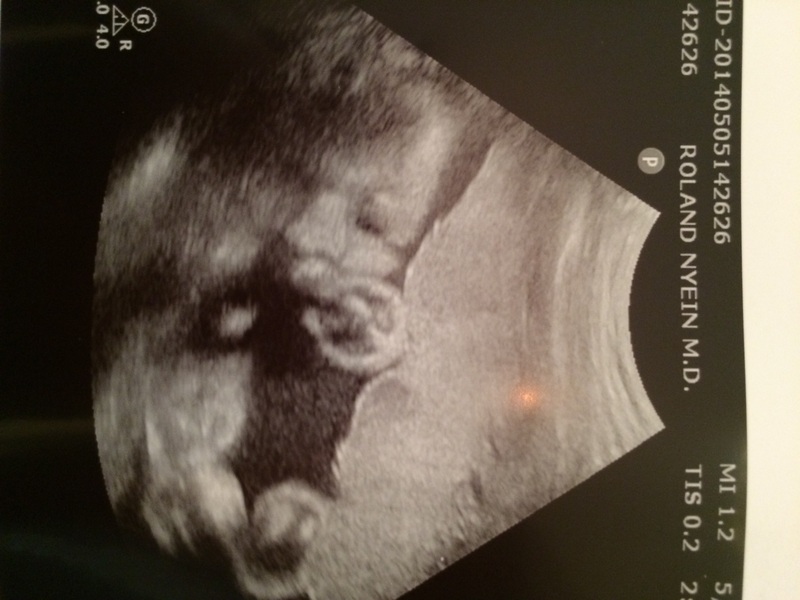 I’ve noticed that our daughter has increased her activity in utero particularly over the past two weeks. Two nights ago, I woke up in the middle of the night to our baby’s foot in my side, and could actually feel the entire foot with my hand! She’s most active in the early morning just as I’m waking up, perhaps because I start to stir at that time. Additionally, I’ve been feeling her start to roll around in my belly–the sensation is incredible! Less sleep. All the movement in my belly also wakes me up more–I seem to be hyper aware of the movement. Unfortunately, this means I’m sleeping less these days, and much more tired during the day. Is this when the pregnancy starts to become difficult again? I truly hope not. On another note, I’m finally counting down the final days until the Delaware Marathon, which is this Sunday! The marathon will be my husband’s first, my third to benefit the Leukemia & Lymphoma Society’s Team In Training, and, most excitingly, our baby’s first!! 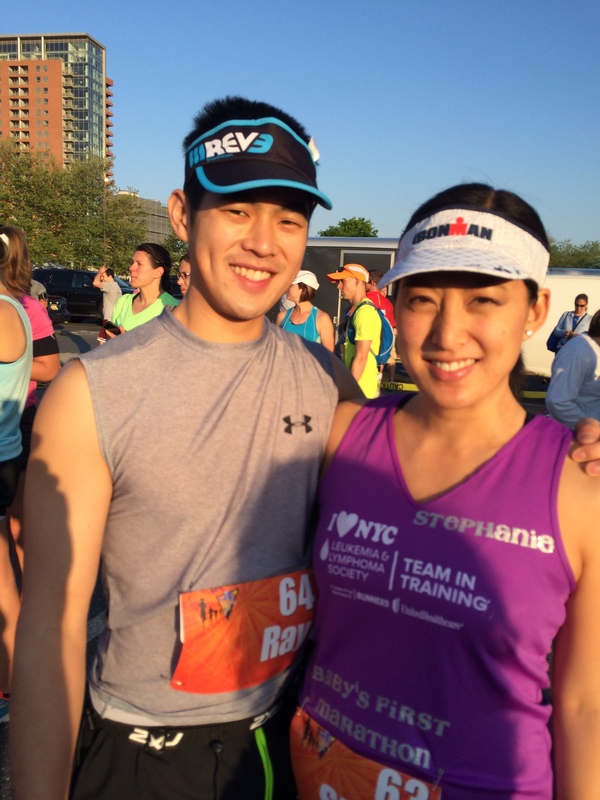 I’m a bit nervous, given the amount of time it will take for me to complete the race, but excited too! 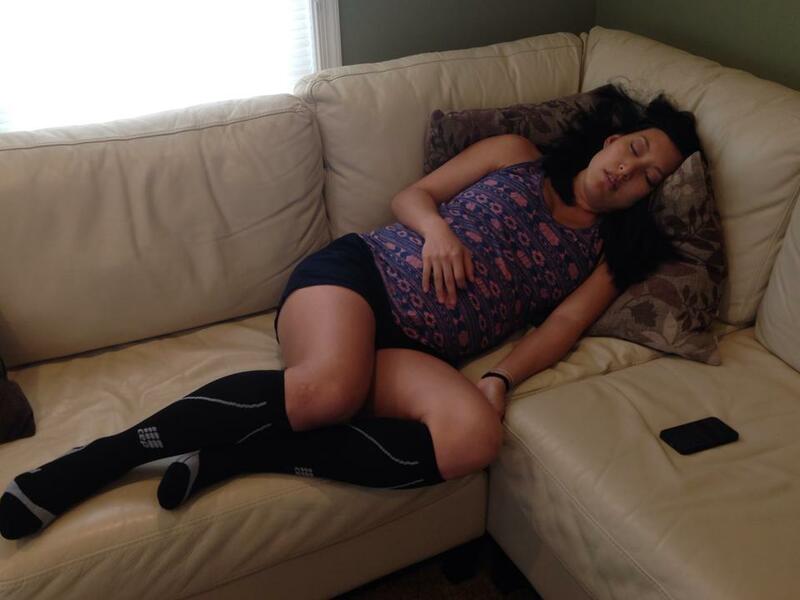 Categories: Athlete, Pregnancy | Tags: Delaware Marathon, Marathons, Pregnancy, Running, Third Trimester, Ultrasound | Permalink.